Alexandra Imelda Cecelia Ewan Burke (born 25 August 1988 in Islington, London, England) is a British soul singer. She is known for winning the 2008 UK series of The X Factor. She had the 2008 Christmas number one single in the United Kingdom with a cover of Leonard Cohen's Hallelujah. 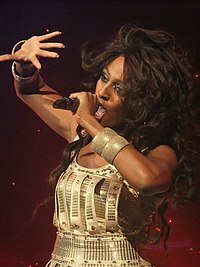 ↑ "Alexandra Burke". Listal. Retrieved 21 February 2016. ↑ Jon O'Brien. "Alexandra Burke". AllMusic. Retrieved 21 February 2016. This page was last changed on 2 September 2017, at 23:39.